The first Husky-class submarine is planned to be completed by 2030. The fifth-generation sub will join Russia's fleet of nuclear-powered submarines, many of which are currently being modernized, including with advanced cruise missiles. 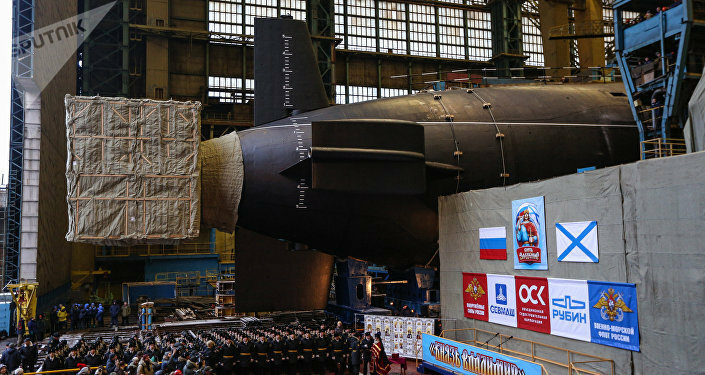 As Russia continues to build its new Yasen-class nuclear submarines and keeps modernizing the Soviet-era Shchuka-class submarines, the Russia Navy has set its sights on a fifth-generation multipurpose sub, which is already in development. The project is known under the name "Husky" and is planned to replace the Shchuka- and Yasen-class submarines. On Wednesday, the commander of the Russian Navy, Adm. Vladimir Korolev, reviewed the preliminary designed of a fifth-generation submarine, which was developed by St. Petersburg Marine Design Bureau "Malachite." The research and development stage of the project is scheduled to be completed next year. The first Husky-class submarine will be laid down in 2023-2024 and will be completed by 2030, Deputy Navy Commander Vice Adm. Viktor Bursuk told Sputnik in July. The construction will be funded under the 2018-2025 State Armaments Program, adopted in 2015 and defining massive military hardware upgrades, with the plan of 70 percent rearmament by 2020. Open sources provide very few details on the project, but what is known already suggests that it will be a breakthrough in scientific and technological terms. According to information from open sources, the main feature of the new Russian submarine will be armed with the 3M22 Zircon hypersonic anti-ship missile, which is already undergoing tests. The specifications of the missile are also kept secret. It is known that the Zircon will be able to reach speeds of Mach 5-10 (5-10 times faster than the speed of sound) and hit a target at a distance of 300-500 kilometers. Currently, the Russian Navy has in service anti-ship missiles with a maximum speed of Mach 2-2.5. "The treats are getting more obvious and more dangerous now. They need to be responded," Adm. Vladimir Komoedov, former commander of the Black Sea Fleet, told RIA Novosti. "I advocate for a multipurpose submarine with maximum versatility. It should have reliable target detections and weapons systems. In addition, it should be able to receive target information from aviation and from space." According to Western and Russian experts, the deployment of Zircon missiles will weaken the positions of the United States’ naval force, which is based on aircraft- carrier striking groups. The National Interest’s observer Sebastien Roblin suggested that the new missile would be more dangerous for the US Navy than the Soviet-made Granit missiles (NATO reporting name Shipwreck). According to Komoedov, the Russian Navy needs new multipurpose submarines that would be armed with a hypersonic anti-ship missile, instead of the Kalibr subsonic cruise missile. The key difference between the Husky-class and the submarines of previous generations is its extremely low level of noise. According to Bursuk, the new submarine will be at least twice as silent as the Yasen- and Shchuka-class. The construction of the Husky-class will involve light and durable composite materials. The submarine will be equipped with advanced electronic systems and will have automatic control and weapons systems. As a result, the submarine will be relatively compact and will be capable of simultaneously tracking a large number of targets. READ MORE: Super Boomer: What's So Special About Russia's New Borei-A Missile Sub? Oleg Vlasov, head of the robotics sector of the Malakhit Marine Engineering Bureau, said that the Husky-class submarine would would be equipped with robotic systems to be used for carrying out tasks for military and civilian purposes. "I can say that there will be robotics on the Husky, which will work in two environments. The development is already underway, now that the forms are laid out, they will be specified," Vlasov told Sputnik. The construction of fifth-generation nuclear-powered submarines will begin after the commission of seven Yasen-class (project 885) submarines, which are planned to join the Russian Navy by 2023. The flagship, the Severodvinks, is already in service. The second submarine, the Kazan, has been floated out and is undergoing sea trials, after which it will join the military in 2018. It will be armed with 533-mm torpedoes, Kalibr-PL cruise missiles and P-800 Oniks missiles. "A global war today is unlikely, but the risk of regional conflicts is high. Taking this into account, submarines armed with cruise missiles will be tremendously important because they can attack both surface and ground targets," Adm. Vyacheslav Popov, former commander of the Northern Fleet, told RIA Novosti. The Russian Naval Doctrine envisages that such submarines will be the core of the multipurpose submarine force until the Husky-class submarines enter service. According to Popov, today the most important capability of a naval force is versatility. According to the Military Balance report by The International Institute for Strategic Studies (IISS), the Russian multipurpose submarine force currently includes one Yasen-class submarine, 11 Shchuka-class submarines, five Antey-class subs, two Kondor submarines (project 945A) and three project 671RTM (Shchuka-class, second generation) submarines. Currently, several project 971 submarines are undergoing modernization, including being equipped with Kalibr-PL missiles. By 2025, four Antey submarines will be upgraded with Kalibr and Oniks missiles. Super Boomer: What's So Special About Russia's New Borei-A Missile Sub?